"Alcazar" is a Spanish word designating a fortified palace. Like the "Alcazars" from Sevilla and Toledo, these palaces were built by the Moors - a people of Berber origins - during their conquest of Spain (12th and 13th century). Officer of the highest rank - general - commander of the revolutionary troops which overthrow the dictatorship led by another general - Tapioca. Those two - Alcazar and Tapioca - will play ping pong with power and overthrow each other. 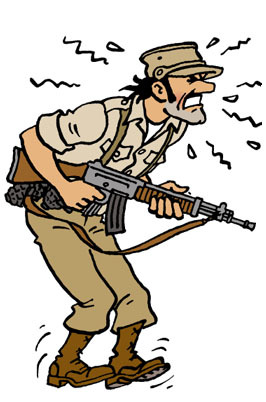 The Broken Ear Tintin's adventure in which Alcazar makes his first appearance, was inspired by a bloody conflict which opposed Bolivia and Paraguay in the 1930's as they were fighting over the "Gran Chaco" territory which supposedly possessed large oil resources. Although it is not said in the album, Peggy is the daughter of Basil Bazarov, the arms dealer who appears in The Broken Ear. "Hergé's most savage and transparent satire is reserved for an international arms dealer of Greek origin who made his fortune from the industry of death of the First World War and afterwards, Basil Zaharoff".